Our “REPAIR STAFF” are amazing. 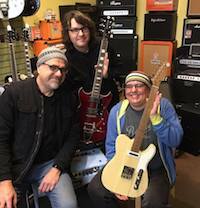 Tom and Jen feel so supremely fortunate to have such wonderful repair-persons AND personalities on-staff to provide both the customer service and instrument service that Brickhouse Music has become renowned for – our belief is that one cannot survive without the other. Clark Thaldorf has been our head band instrument repair tech since 2000. Clark brings a wealth of experience as a graduate of Western Iowa Technical College for Band Instrument repair, Winona State University and Martin Luther College for Music Education. He worked for many years on the sales floor, teaching trumpet and saxophone lessons, playing bass AS WELL AS repairing every band instrument that has come through our doors. Clark is also one of our road reps visiting multiple schools two days as week, and working directly with school directors for their school and student needs as well as repairs. Assisting Clark is Kim Johns, former band director for the Amery public schools for over 15 years, who has retired from teaching and is gracing our repair area with her knowledge and expertise…as well as her high standards for cleanliness…Kim loves to clean instruments and her organization skills are very welcome in the repair center! Jeremy Davis is our stringed instrument repair area isresponsibility, and Jer has been taking care of your violins, violas, cellos, basses, guitars, ukes, mandolins, banjos, etc. since before 2006. With his vast woodworking experience and schooling, Jeremy takes on every challenge and excels at it. He loves extolling his knowledge on after-market products, installing and upgrading pickups on acoustic and electric instruments, performing setups and technical adjustments as well as doing full restorations and helping customers on the floor with their daily music needs. We are blessed to have him as “our guy”, as Jeremy’s knowledge is as far-reaching as his generosity. Electronics Repair is not an easy task, which is why Brickhouse has enlisted Derek Farber, a veteran in repairs ranging from vintage and tube amps to modern day PA and keyboards. His painstaking detail work pays off in spades when he brings those favorite pieces “back to life”…our customers could not be happier with his quick-turn-around and his perfectionist standards. Though BHM is lucky to have such fantastic repair talent on staff, and we are even more blessed to have these PEOPLE in our midst. Each one of them has high standards, the need to reclaim the instrument in front of them, but even more importantly, the drive to be the best that they can be for each and every customer that comes through our doors. For an additional bonus, each one of them has amazing musical talent – they all perform regularly both locally and regionally. Enjoy meeting them – be amazed working with them.